Just before the Easter weekend, Seattle band Citizens dropped their brand new single You Brought Me Back to Life, the first taste from their forthcoming second album. Reel Gospel readers are big fans of this band, voting their self-titled debut as their favourite album of 2013. I last spoke with Zach Bolen, lead singer of Citizens, back in January in a studio exclusive – and as you’ll read below, it happened on a pivotal day in the recording process of their forthcoming second album. Here’s my latest interview with Zach, which happened earlier this week, where we discuss the new single, thermal blankets, Outback Steakhouse, and also much more about the upcoming second album. SAM: How have things been since we last caught up? ZACH: When we talked before the Superbowl! SAM: Yes, and the Seahawks won! ZACH: Yes. Oh man, that was a great week. So we were in the studio at that point working on the new album, and we’d hit a bit of a rut right there. SAM: I remember that – it was that day too. You didn’t seem that enthused. ZACH: Yep. You’re actually going to love this. Maybe it was you – the sunshine down in Australia that brought some hope. But it was that day, my last day in the studio and we were trying to finish up a song – which will be on this album – but it definitely wasn’t ready. We started recording vocals for it and knew the song wasn’t right. And then I left for the week and I told Brian, ‘Hey, check out this other song I was working on that may be a good song to write some lyrics to.’ And he spent the week working on it, and we wound up after a week writing You Brought Me Back to Life. So that’s how that song came about. Last minute, down to the wire, we need another song, we don’t think this other song is going to work out. And then – totally the will of God – wanted us to wrestle a little bit. Be a little more dependent on him on this. This other song, The Lord’s Prayer, worked out as well. That’s cool to see that happen. That’s been our world for the last few months, just trying to finish up the album and get some good cohesion and make it very helpful and useful to the church. That’s been our primary focus. And of course, moving over to Mars Hill Ballard has been a transition as well, getting new people, leading new teams, building new bands, all that. It’s been a lot going on, but lots of exciting things for sure. SAM: Has it taken longer than you anticipated for this album to come together? ZACH: Yes. Absolutely. Originally when we talked back around the Superbowl that was supposed to be our last week in the studio. And we wound up taking another couple of weeks after that because it just wasn’t ready. In fact, we tried to do that whole album in a month, which was a terrible idea. [Laughs] We were just trying to force creativity and all these other things. I’m thankful that we had to adjust and really give it some more time. The Holy Spirit was… We were able to help us write, finish the songs, and get in a better spot by having some more time. So it’s taken a while, maybe a little longer than we’d like, but nevertheless I’m still excited about how it sounds and the way the songs have come together. SAM: The single which you unleashed just in time for Easter – You Brought Me Back to Life – what’s the story behind the message of the song? ZACH: That song was interesting because when Brian started to work on it… I had the whole instrumental track done. At least just the demo was done. I hadn’t really had a whole lot going on. I was recommending that we go with maybe something like 1 John 1 – let’s write a song about how walking in the light of Christ produces fellowship. Then he just went in a totally different direction, which I love, and it turned out nice. He went to Romans 6 or passages that hit a lot on this idea of rebirth in Christ. The passage that I’d been really loving and using a lot when referencing this song is the passage in Romans 6:9 – ‘We know that Christ being raised from the dead will never die again. Death no longer has dominion over him.’ What I love about that passage and how it relates so well to this song, is that because we’re in Christ we get to proclaim the same thing. Death no longer has dominion over us as well. Which is so cool. But then, the other aspect of it too – we realised we [the church] had a lot of songs for baptisms. We’ll sing different songs that celebrate what Jesus has done. But we don’t have a whole lot of songs that speak of baptism: us identifying both of the death, burial, and resurrection of Jesus. So that’s why we’ve been using some of that language. ZACH: Yeah we’re gonna provide the spotlights and the confetti. Probably the announcer voice. Maybe you could do that? SAM: No! I’m not American! You need that booming American voice. ZACH: If there’s anything I know about anyone I’ve met from Australia – they do a much better American accent than we do of Australian accents. SAM: I haven’t heard your Australian accent before! ZACH: You don’t want to, man. All I can sound like is the Outback Steakhouse commercial here. SAM: Which doesn’t exist in Australia, may I say. It’s all a hoax. ZACH: I heard too that it was Jemaine from Flight of the Conchords. Aren’t they from New Zealand? That’s even more of a hoax! SAM: I mean we’ll claim people from New Zealand. We did that with Lorde when she got big last year. SAM: Now back to the song and the idea of the resurrection. What is it about the resurrection that hits you hard? What can’t you get enough of when you think about it? ZACH: I think the biggest thing is that… One: it’s historical. It’s been accounted for from a number of different historians that aren’t necessarily Christians or converted at the time. So it’s historical. But it’s also incredibly prolific. You have this man who is claiming to be God, who was murdered because he was claiming to be God. And then the same man that they murdered was put to death – securely buried in the tomb – that same man that they killed because he was a ‘heretic’. For him to actually kill all those lies and put all the false claims they put against him… He did that by conquering the grave and doing something that no human being can do. I think that’s such an incredible thing. You can talk to someone about Jesus’ life, and you can talk about the miracles – the resurrection is an incredible miracle in itself – but you can talk about the things that he did as a man on earth in his years of ministry. People will go there. But when you start talking about the resurrection – such a profound thing – you either believe it or you don’t. What I love about it is that it’s a great image of glory. Of Jesus not only putting to death our sin, but the evidence of his grace. Not only did he remove our sin on the cross but he actually gave us new standing with him. What I think is so crazy is that even in a passage like Romans 6, now we know that we look to the day where we’ll be fully resurrected with Jesus. That we could even have the same language. That we could identify… It’s not just us saying we’re ‘in Christ’, it’s the same language and things that we get to claim as well. We’re not deserving of that in any way. Yet Jesus has allowed us to boast in his resurrection. I think that’s such a great picture of heaven. The joy that’s set before us. One day we will stand before Jesus. If we could have been at that scene… nobody actually saw the stone being rolled away but I would imagine that what was so powerful about that was the glory of God and his light shining out the darkness. Exposing Satan’s lie that we could save ourselves, and we have the power within ourselves to do the same work that Jesus did in order to earn salvation. It just killed all those lies. It made it clear that there’s only one way to defeat Satan. There’s only one way to defeat death and it’s through Jesus. He conquered the grave. That’s such an important piece that we often forget when we share the gospel with people, or when we write songs. We talk about Jesus dying for our sin, and we talk about the cross, but we sometimes leave out the amazing truth of what the resurrection is. And it defies all human logic. That’s why we must share it. It’s not human. It’s God. It’s God defeating everything that we couldn’t. It’s us having right standing with him. Us being justified with him because of his ability and his work in conquering the grave. SAM: I’m going to say that You Brought Me Back to Life is a hit. It’s a winner of a song. But back when we talked about your first album, you said that Made Alive came out and you didn’t expect that to be a radio success like it was. Was there any pressure to create another radio-friendly single? ZACH: No, not at all. I think the reason why is because we have been so focussing on our mission – to serve the local church. Here’s the truth: hopefully not just our music, but a lot of people who write music or writing worship songs… We might see style of You Brought Me Back to Life and in a couple of years, then we might say ‘Well let’s move on.’ We’re over that. I don’t know. But if it does, hopefully the lyrics stand. I do believe that that song is so rooted in gospel truth and saturated in the Bible that even if people move on from the style of the song, lyrically and melodically hopefully it still holds the test of time and is true and it still has incredible weight. As far as radio goes, we want to write songs that are accessible, but radio is not our aim. The big thing for us is writing songs that the church can sing. Hopefully over time we’ll see a trend in radio where it will be less Christian bands and more worship bands that write songs about Jesus. The other bands that aren’t as explicit but would consider themselves Christian bands – my hope is that they would take the risk and get out in the world of being with other artists that wouldn’t call themselves Christians but try to write music that would be just as artistic and creative as the other people who are putting stuff out there, that don’t love Jesus, they aren’t writing for Jesus, that have a different motive. I think there’s a lot of opportunity there. SAM: That knocks me over about you guys. To have sound doctrine in song, played on the airwaves, nothing ambiguous about it. It’s great and I hope this single does the same thing. ZACH: Me too. I appreciate that Sam. SAM: Let’s talk about the musical arrangement of the song. It is quite electronic in sound. Why did you, and perhaps Brian too, feel to go down that path rather than a guitar-driven sound? ZACH: You know, believe it or not it was all me on this one! [Laughs] Some of that was a result of – it’s a style of music that I gravitate toward a lot. I like a lot of different music but that song – Brian and I as we’ve got to know each other have become one in what we like. There was a point in time where we’d record and he’d be telling somebody to play one thing and I’d be like ‘What?! I hate that idea!’ or the reverse. Now I feel like we’re getting synced up more. So I think this song was natural for the both of us in that way. I don’t know – I didn’t give it a whole lot of thought other than, ‘Does this feel good?’ Musically it feels right, it feels fun, feels like a party. If you want to get into the nitty gritty of it there are some interesting things happening, even with the bass, that make the rhythm interesting. It’s the same – we added a pickup chord in there – but it’s basically the same two chords the whole song, with the exception of the bridge. But the way it moves and everything – you don’t even think about that. I’ve always been interested in taking the most basic chord structure and adding things to it where it doesn’t feel so simplified but it actually has some good… There are a lot of songs out there that have two chords but there’s a way that a band can arrange it to make it sound more than just two chords and simple. So I think it has a lot of that, with the keys. SAM: And that bridge, when the piano comes in – boom! That hits hard. ZACH: We had a blast on that part. There’s actually a Christian college up the road and they have a gospel choir. So we got them to sing on that song, on the bridge. That was so fun to have them join us on that. It has such a gospel feel to it on that spot. That was all Brian. The main chunk of the song, the verse, the chorus and all the instrumentation was stuff I’d already put together. Then Brian just went and brought the bridge together in a really cool way. It was neat to have him on that part and have some fun with it. SAM: And have you brought some lasers and smoke machines to your live show yet, to match the sound? ZACH: Absolutely. We basically use lasers to emulate water splashes all over the stage for baptisms. It’s wild. One big wave on the stage, and we’re just in the wave. Like a big pool of water. SAM: It’s like a wave pool without getting wet! SAM: What music are you listening to at the moment? ZACH: Manchester Orchestra – really into them a lot. They put out a new album. This band called Cymbals. They’re electronic – the reason I love them is that I’m a big David Bowie fan, and they have a very updated 80s David Bowie vibe going on. I’m always about that. When you live in Seattle, everyone turns you on to indie bands that no-one’s ever heard of. So when I say album titles I feel like such a hipster. SAM: Aren’t you all hipsters in Seattle? ZACH: That is true actually. Because whenever I go to another part of the United States I always feel a little awkward. So I don’t know. SAM: At this stage there’s only been a teaser for the music video posted on Instagram. It’s looking good with lots of neon colours going on. What can we expect from the whole thing? ZACH: We played off this idea of synesthesia where you when you hear musical notes you see colours. So that’s the concept we were playing off of. It’s coming together, pretty close to being done. Hopefully this week. But the big idea that you’ll see, the theme is this – the vibrancy of the resurrection but also the celebration of baptism. It’s intermixed with the band playing and the different colours happening. Some people might pick up on this, but each colour that changes corresponds to a particular note. It’s weird but awesome, really cool. But intermixed with that is actually baptism happening. And so we wanted to implement that and show someone coming out of the water and seeing life in this full and amazing way. And we don’t necessarily believe at Mars Hill that baptism leads to salvation but it certainly is identifying with Jesus in his death, burial, and resurrection. That’s such an amazing picture. Our eyes are now open to see things we weren’t able to see before. We were walking in darkness and didn’t realise it. Now we’re walking in light and it’s the most amazing, glorious thing that our eyes could ever witness. That’s what we wanted to do with the colour. SAM: It must have taken a lot of editing to time those colours to the beat. ZACH: It was an insane amount of editing. That guy did an incredible job. He’s one of the dudes who worked here at Mars Hill. He’s a great dude. Really just put together a great video. SAM: And is the sound we’re hearing on this song reflective of the album? ZACH: I think so. I think there’ll be a lot of that on the album. But I think too – the tentative title that we’re planning on going with for the album is Join the Triumph. And the main thing that we really wanted to do was for it to be an album that – whether it’s a slow song or a fast song – creates a movement, and a participatory element to it. I feel like all of our songs have had that, thankfully. But this one even more has it in a way that there’s this… A couple of the songs have a very active – so whether you want to dance to it or not – but it’s something you want to sing to or participate. I think we have the same thing happening in some of the other songs that we didn’t have on the last album, on the more contemplative, slower songs. I think we have songs that you want to engage in. One song is from Psalm 139 which is such a great psalm that I’m really thankful for. I’m really excited for people to hear it. It’s a song of confession and repentance. Asking God to search our hearts. We actually used almost all of the passage to write that song, you’ll hear a lot of it. We tried to be really specific to the Scripture. I’m pretty excited but even that is an active thing. What a weird thing: to ask God to search us and reveal to us the dark places in our hearts and in our souls. But we know there’s freedom in that, in his grace he guides us out of that. I think there’ll be a lot of dancey kind of stuff, electronic stuff, but there’s also big anthemic songs that I’m praying and trusting the Holy Spirit will do a lot of good stuff with in the church. SAM: I’m so looking forward to hearing it. I assume it’ll be out in the coming months? ZACH: Yeah, we’re shooting for August. But you never know. Hopefully we’ll have an official date here soon, but we’re shooting for late summer. SAM: It’ll be late winter here. It’ll warm us up! ZACH: That’s even better for you guys! We’ll be sure that with all the Australian CDs we’ll send a blanket with it or something like that. SAM: I look forward to that! ZACH: One of those thermal blankets! Basically like wrapping aluminium foil around yourself. SAM: That’s why you have to buy physical copies of albums! ZACH: Yep. Branded thermal blankets. SAM: What about people in the northern hemisphere? What are they going to get? ZACH: Since it’s the summertime, we’ll probably give them a bunch of sunglasses. Except they’ll be lightning bolts. SAM: Yes! Do you mean the Kanye grill but with lightning bolts? SAM: I’ve got one last question for you Zach. It’s very serious. You put a photo on Twitter of you in a bear costume. Should we be concerned about this? ZACH: [Laughs] It was not surgical. That was one of those random moments where it was a bear – it was a jacket! It was a bear jacket! I had to try it on. I got my wife to take the picture, my kids loved it. The things you do for your kids. And then you show the whole world, I guess. My kids were only concerned for a while. They thought for a minute that I had actually turned into a bear, but once they realised that wasn’t the case, things were good. So we’re back on good terms. SAM: Once again, thanks so much for the chat and we’ll talk again in your summer! ZACH: Looking forward to it. Take care. 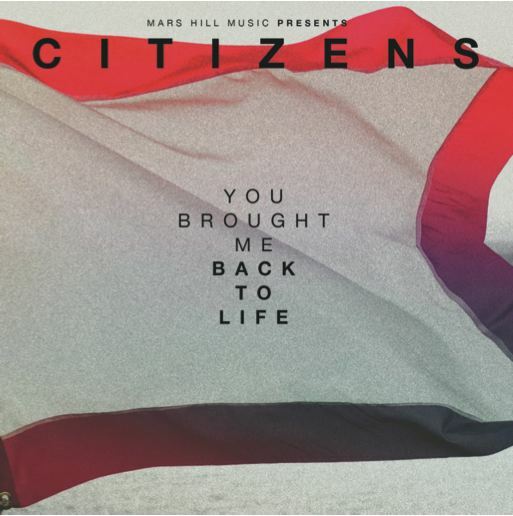 You Brought Me Back to Life by Citizens is available now on iTunes. It will also feature on Citizens’ second album, to be released later this year. For more news on the album as it comes to hand, follow Reel Gospel on Facebook and Twitter. Posted in MusicTagged Citizens, Interview, Mars Hill Church, Mars Hill Music, You Brought Me Back to Life, Zach BolenBookmark the permalink.